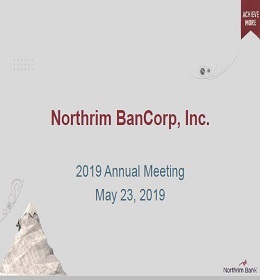 Northrim BanCorp, is the parent company of Northrim Bank, an Alaska-based community bank with 15 branches in Anchorage, the Matanuska Valley, Juneau, Fairbanks, Ketchikan, and Sitka serving 90% of Alaska’s population; and an asset based lending division in Washington; and a wholly-owned mortgage brokerage company, Residential Mortgage Holding Company, LLC. The Bank differentiates itself with its detailed knowledge of Alaska’s economy and its “Customer First Service” philosophy. Pacific Wealth Advisors, LLC is an affiliated company.